Water brick, silica sand filter stone, sand-based permeable curb stone, silica sand well block, silica sand drain cover and other products. ( 4 ) Wear resistance: the length of the grinding pit is ≤ 35mm . The current urban branch road is cement concrete pavement, and the parking lot is laid with grass bricks. Base Through the Horizontal Edge Stone Paving. The design of the branch road and parking lot of the project area shall be in accordance with the “Code for Construction and Acceptance of Sand-Based Pervious Brick Project”. The specific practice of the road surface is shown in Figure 6.3-3 . After the tributary pavement and parking lot are paved with water, the height is 10.5cm , and the blind ditch and pebbles are set in the green space. Figure 6.3-5 and Figure 6.3-6 . Greening the parking lot, guiding the vehicles to be neatly parked, and replanting greenery in places where greening is missing. In order to transform the current temporary work shed into a non-motor vehicle parking garage, 296 non-motor vehicle parking spaces can be set . This design and construction should follow the construction order of the first underground, the rear ground, and the deep to shallow construction, that is, the construction pipeline first. Then carry out green planting and side stone installation, and finally complete the asphalt paving. 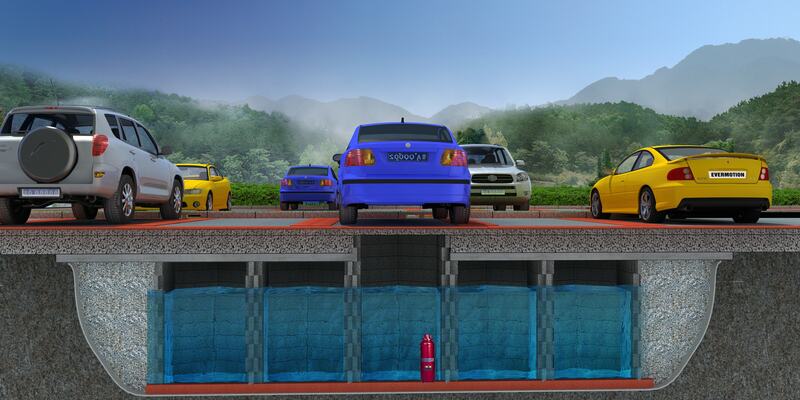 The function is to purify the rainwater at the beginning of the road and part of the green space, and reduce the initial rainwater pollution. The total length of the pebble side trenches laid in the green space behind the house is about 1320m . A 300mm × 500mm permeable blind ditch is laid in the green space near the road side , and the cover is 6.5mm thick sand base. The rainwater and the rainwater exceeding the permeability of the permeable bricks can all pass through the side of the opening to the blind ditch. The water resources in Hefei City are in short supply, and the water pollution around the city is serious. The rain should be implemented as much as possible through engineering measures. Resource utilization of water. 1 The roof rainwater in the community is disconnected by the rainwater riser and discharged to the pebbles on the outside of the building. The side ditch also plays the role of energy dissipation and retention. Rainwater in the pebble trench can pass through rainwater pipes or through green fields. It flows to the permeable blind ditch near the road side, where it also makes full use of the retention and infiltration of the green space behind the house. 2 The sand-permeable bricks are laid in the community branch road and the parking lot, and the rainwater in the infiltration part is sent to the slot of the current road surface. The drainage system collects rainwater, absorbs rainwater on the spot, relieves internal hemorrhoids, and effectively removes larger particles in rainwater. Contaminants to reduce the filtration pressure of subsequent reservoirs. It is placed in the inspection well of the rainwater drainage pipe network in the community, so that the muddy sand in the turbulent state rainwater is trapped in the muddy sand. In the well, the mud sand is reduced to the rainwater reservoir. The outer wall of the reservoir is separated from the outside by a reinforced concrete structure. The honeycomb is placed in a honeycomb siliceous block. The air block and the wall of the pool are filled with aerated blocks. The reservoir adopts a honeycomb structure, which can achieve stable structure. According to the corresponding indicators, it can realize the simultaneous filtration and purification, anti-seepage and anti-evaporation integration, and ventilation and preservation. The reservoir is designed with simulated stratum structure, and it is deeply filtered and biologically purified by sand-based filtration wells. The structure of the pool structure and the water flow organization and the silica sand reservoir are shown in Figures 6.5-1 and 6.5-2, respectively. We can provide DWG files for the design upon request.